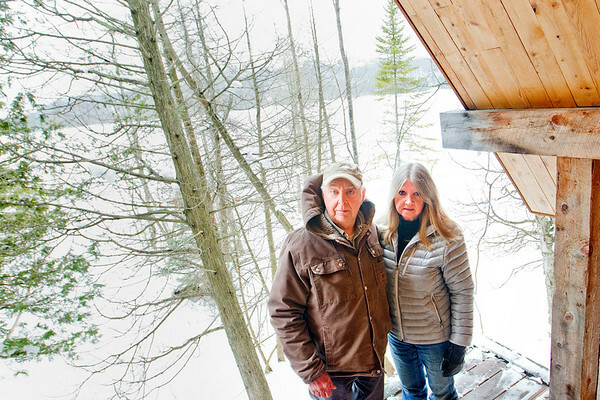 Len and Gwenne Allgaier say a culvert that allows water to flow under West Traverse Lake Road in Maple City from Little Traverse Lake into Shalda Creek is causing problems such as the death of trees on the water side of many homes, the growth of algae in the lake and damage to the creek from sediment build up. Water flows from Lime Lake into Little Traverse Lake, then through a culvert into Shalda Creek on its way to Lake Michigan. "By any meaasure, that tiny little aperture, as a substitute for the original 25-to-30 foot-wide stream, is dangerously obstructive," said Len Allgaier.